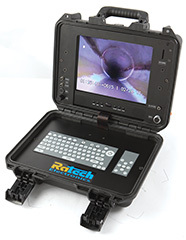 The Elite-SD© is the newest innovation in closed circuit pipeline inspection technology. The SD is constructed around a fully digital SD card recorder and optional built-in hardware. The CCU folds up into a compact, slim, and lightweight briefcase style unit, weighing a mere 10 lbs., making it easy to carry with you. A 8" Hi-Resolution LCD screen keyboard make up the remainder of the Elite-SD system. The SD Card recorder is accessible from the front of the unit making it convenient to record your inspections directly onto an SD Card. The video is recorded on the fly as you are performing your inspection. The video is recorded in MPEG-4-SP ASF format allowing up to 240 minutes can be recorded onto a 1GB SD card. The control unit is designed with all operating functions top mounted for ease of use and monitoring. Included on the panel is a camera test terminal for easy analysis of problems that may occur. It allows the camera to be tested without the cable reel.